University Of Wah Admission 2019 are open now for graduates, undergraduate & phD programs. 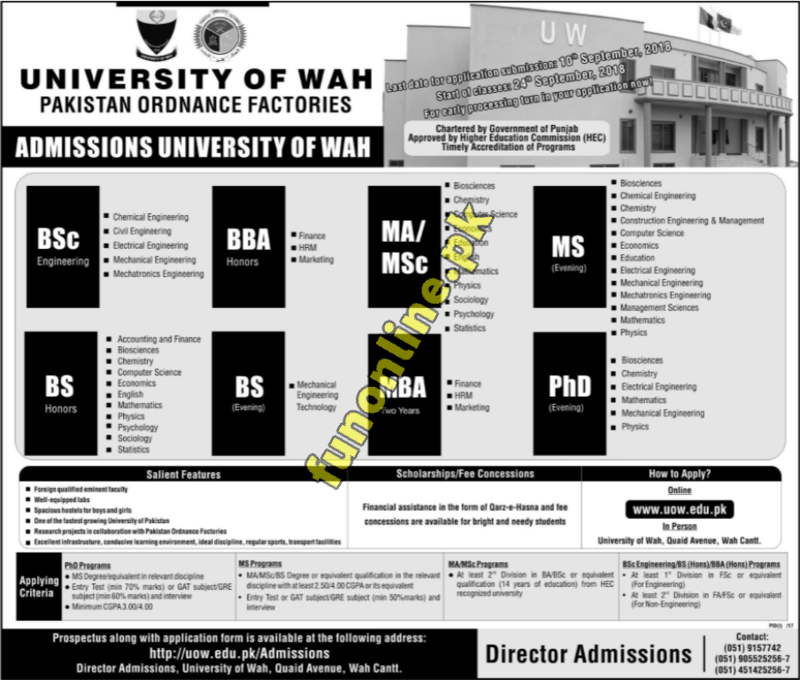 University Of Wahh cantt admission 2019 last date is 10 september 2019 till then you should ready your documents required for admission UOW cantt 2019. Here at webstudy.pkk you can get complete details of University of Wah UOW Wah cantt admission 2019 for bachelor, Gradudates, Undergraduate & PhD programs. 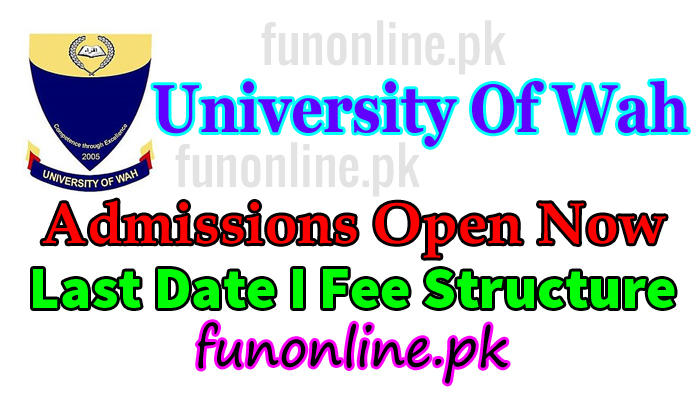 How to apply for admission uow wah cantt university 2019, entry test, late date, admission form download, admission procedure, uow fee structure & admission policy details are here. University of wah is famous university located in wah cantt Pakistan. UOW admission 2019 opens once a year so thousands of students apply for admission but only lucky ones who will be on 100% merit list got admission in UOW cantt. University of wah cant is HEC ranked university and have space in the list of top universities in Pakistan by ranking. University of wah was established in 2005 but later in 2009 Punjab assembly pass the Act of Wah University. University offers programs in various faculties and have various durations of programs ie Bachelor program 4 years and 2 years masters programs in various fields such as basic sciences, social sciences, management sciences and engineering sciences. University also offers Phd Programs. University of Wah offers 4 Years BS Hons BSc program in following subjects. UOW Wah Cantt Admission 2019 in MA M.Sc are available in following subjects that you can choose in which you are interested. University Of Wah admission 2019 MS & M.Phil programs will be in following subjects. equivalent qualification from HEC recognized University.